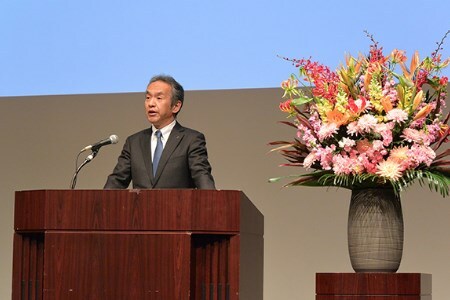 Mitsubishi Heavy Industries Ltd (MHI) held a ceremony at Shinagawa Intercity Hall in Tokyo, Japan, to formally welcome the employees joining the company this year. MHI President and CEO Seiji Izumisawa, who also assumed his position that same day, offered words of encouragement to the new recruits, the majority of whom are recent graduates just starting their careers. He indicated how the new recruits should prepare themselves to be MHI employees, and expressed his high hopes and expectations for their future achievements. Izumisawa began by presenting an overview of MHI, including its origins in 1870 with the founding of Tsukumo Shokai by Yataro Iwasaki, and the start of full-scale operations in 1884 with the establishment of the Nagasaki Shipyard & Machinery Works. He noted how MHI, as a global conglomerate comprising around 300 companies worldwide, has contributed over the last 135 years to the development and manufacture of a wide range of products, many of them firsts in Japan or global markets. He cited as an example the MRJ (Mitsubishi Regional Jet), Japan's first passenger jet developed through the efforts of the entire MHI Group. Development of this aircraft began in 2008 and, in March this year, test flights to gain safety certification began in the US. Izumisawa noted that entry into the market for finished aircraft will not only support the advancement of MHI Group, but has been a longstanding aspiration for Japan's aerospace industry, and that this ambition is now steadily becoming a reality. He urged the recruits also embrace new challenges in their own way. The MHI Group is pursuing new strategies and initiatives outside its conventional framework in order to accelerate global expansion, and achieve a business scale of more than 5 trillion yen. The president described the company's programme of selection and concentration, including the reorganisation into three domains (Power Systems, Industry and Infrastructure, and Aircraft, Defence and Space) aimed at taking advantage of the group's collective strengths to provide high value-added solutions to meet the current era. He also explained MHI's shift to management, emphasising earnings improvement and cash flow, describing it as an "offence and defence" strategy to hedge against risk and support expanded investment in new businesses. He stated that going forward, in order to raise MHI's presence in overseas markets and establish a brand as well recognised as it is in Japan, he is looking to combine MHI Group's proprietary technologies with the needs and values of customers around the world to offer new levels of value. Izumisawa pointed out that under the more offence-orientated organisation established through the range of structural reforms, the company is implementing measures to advance to a higher stage for sustainable growth, and he urged the new employees to join in combining their strengths, and working together as a group to advance steadily forward. Izumisawa noted that in 2016 MHI formulated a new tagline, ‘Move the World Forward’, for all employees within the MHI Group. He explained that this phrase incorporated the spirit of all employees striving alongside customers and communities around the globe to drive the world forward and develop a sustainable society. It was stressed that sustainable growth requires advancement in the natural and social sciences, remaining constantly aware of technological progress, and continually striving for a high level while incorporating thinking and new technologies from around the world. Izumisawa also noted that on the occasion of MHI's 130th anniversary in 2014, the company adopted the goal of "active participation of women and greater diversity in the workplace," seeking to ensure that all employees can work in a climate of fairness and diversity, regardless of such factors as gender or nationality. Lastly, Izumisawa also spoke about his personal motto of "shu-ha-ri" (the three stages of mastery), a term from martial arts such as kendo, which he has practiced since his school days. He explained that "shu" (obey) is the stage at which one faithfully follows the teachings of one's instructor and acquires fundamental skills, followed by "ha" (deviate), when students enhance their abilities by applying their own ideas based on what they've learned, and finally "ri" (separate), the stage at which learners establish something new on their own. Izumisawa stated that it's only once you've firmly acquired the basics, that you begin to deviate from established forms. He urged the recruits to find the positive traits in their seniors and eagerly make them their own. He concluded by expressing his hope that the incoming employees will become international businesspersons with cosmopolitan outlooks who will forge new paths for MHI Group and the world.